The distance between Shimla and Manali is 265 kilometers but buses and cars take 8 to 10 hours to travel this distance as the whole road passes through hills and there are lots of twists and turns on the way and average speed of the vehicle remains between 25 to 40 kilometers per hour only. There is no option to travel to Manali by train as, the nearest Broad gauge railhead is in Chandigarh only which is also at the same distance from Manali as Shimla is. Thought there is an airport at Shimla and Manali there are no flights between Shimla and Manali. So the only option left is to travel by road only by buses and taxis. A number of buses ply between Shimla and Manali but most of them are ordinary buses operated by Himachal Roadways (HRTC). 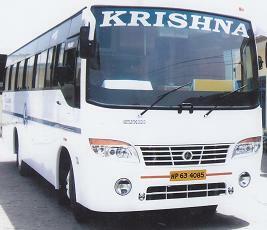 There are two deluxe non-AC bus services between Shimla and Manali; first by the Himachal Roadways and other run by Krishna Travels Shimla. 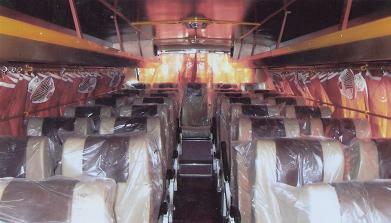 There is no other VOLVO or any other air-conditioned bus service between Shimla and Manali other than this. Your online payment will be kept on hold and realized only if the booking is confirmed from our end otherwise the transaction will be cancelled and you will get the full refund. Booking can be cancelled anytime before three days of journey date. Cancellation Charges Rs 100 per ticket. No refund if booking cancelled within three days from journey date. Our best efforts will be there to provide the bus service / alternate arrangement, but in case of any exigency if we are not able to provide the bus service our liability will be limited to refund to 100% advance payment.